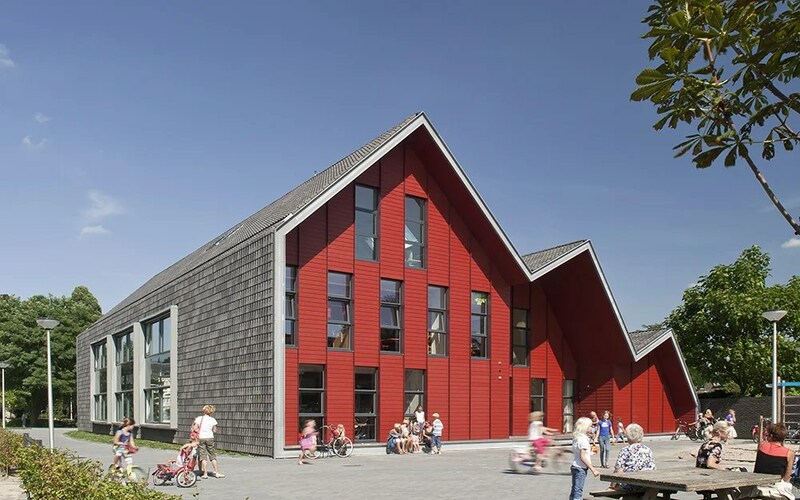 ‘CBS De Haven’ is an elementary school and daycare center located in the city of Doetinchem, the Netherlands. 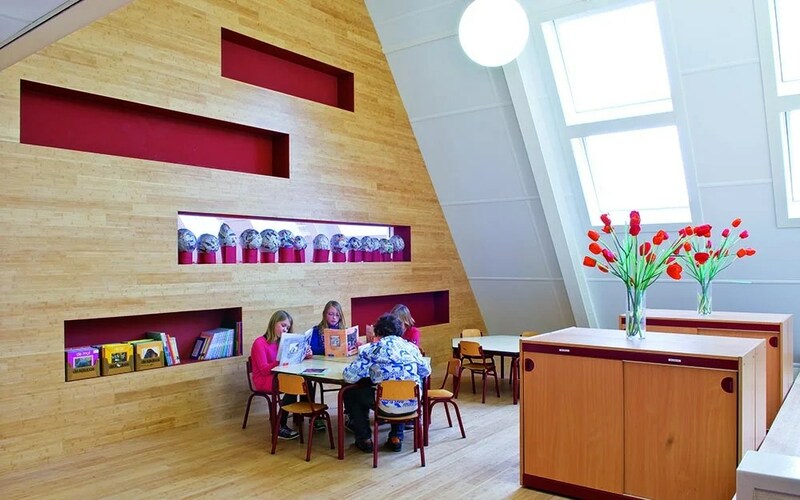 The school’s main ambition is to offer a diverse learning environment using multiple teaching methods. This ambition is translated into a welcoming and hospitable building design. The volume resembles the typical and recognizable shape of a house with a pitch roof, making the school feel ‘like home’ to the children. The interior design is consciously being kept intimate, functional, clear and bright. This is emphasized by using natural and warm materials. Some of the furniture is custom designed for specific purposes. This includes a multi purpose cabinet, used for both storage and as a coat rack. At the ground floor the main entrance is situated including a giant wooden staircase. 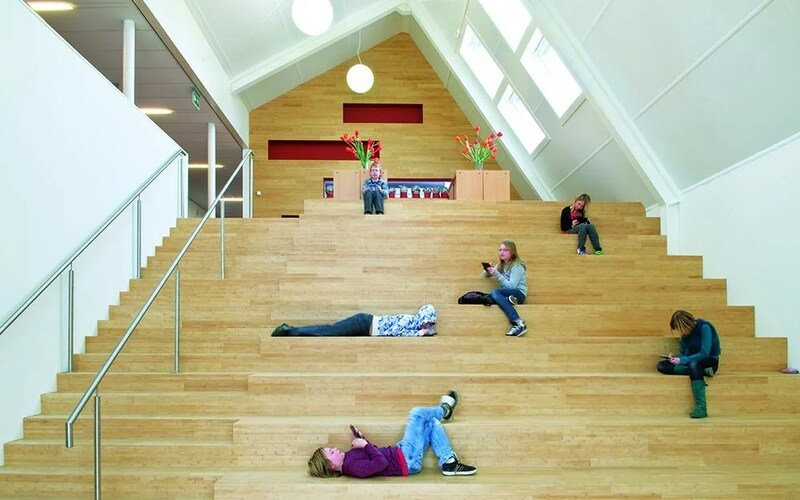 This staircase functions as a grandstand, stage and exhibition space. The space is two stories high and provides an interesting view on the roof construction. At the backside of the building outdoor storage space is situated underneath the pitched roof as well. As well these facilities close off the property. By including these spaces into the main building volume, vandalism is being prevented and the outdoor space is being kept tidy and orderly. The outdoor space surrounding the building includes a school garden, butterfly garden and orchard. These elements aim to encourage the children’s consciousness of the natural environment. All materials used within the design are child friendly and low on maintenance. This directly leads to lowering of operational costs on the long term. 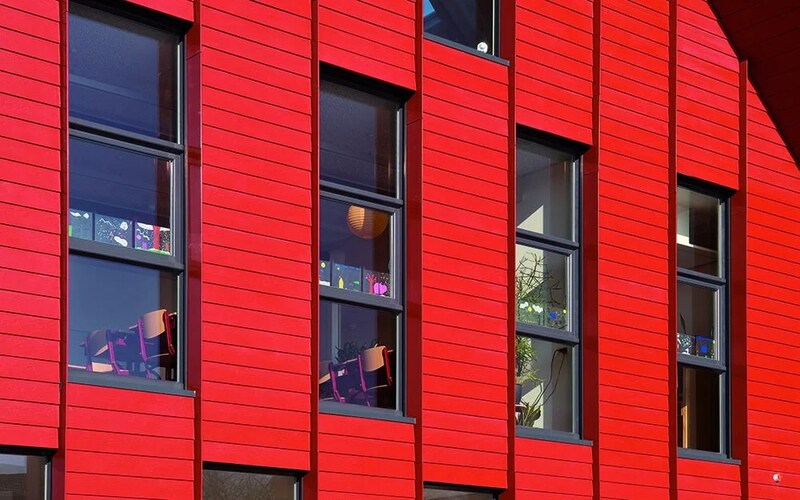 Because of these thought through design principles, the project was granted with a subsidy for energy neutral buildings as well.